An unhappy wife (Audrey Hepburn) reflects back on her troubled marriage to an architect (Albert Finney). Peary writes that this Stanley Donen-directed romantic comedy (written by Frederic Raphael, who also scripted John Schlesinger’s Darling and Stanley Kubrick’s Eyes Wide Shut) is a “cult film for romantics”, “many [of whom] have been known to become emotionally attached to it”. He notes that “while watching Finney and Hepburn at various times in their relationship”, we “can examine their marriage from the outside”, and clearly “see the road-as-life and trip-as-marriage metaphors”. He argues that “we come to like these two people more than they do themselves”, and to “understand why their marriage has lasted and will survive”. He states that “they are a great couple, flaws and all”, and refers to them as “one of the few screen couples since William Powell and Myrna Loy who make marriage seem exciting”, given that “even their squabbling is romantic”. He argues that Raphael’s script possesses “excellent” dialogue, and that “he smoothly blends comedy… painful drama… and sentimentality”. 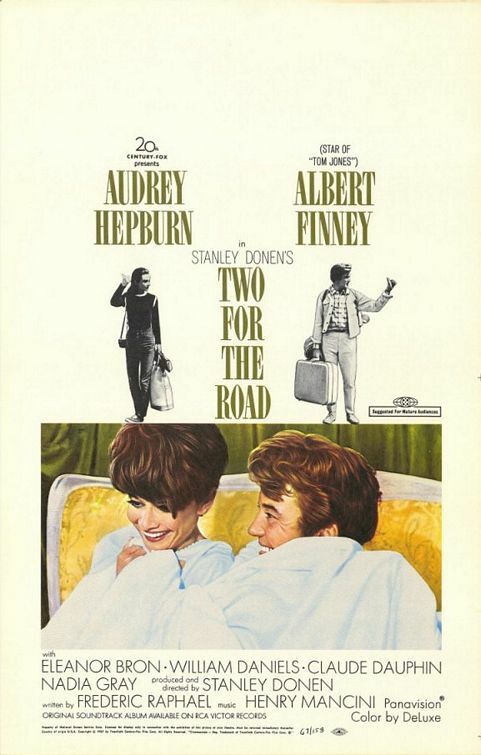 Finally, he notes that “Donen does a good job handling the changes in tone, except when he attempts some speeded-up slapstick during the film’s least successful sequence, in which Hepburn and Finney travel with super-punctual William Daniels, his wife, Eleanor Bron, and their bratty daughter”. Yet clearly Two for the Road resonates on a deeply personal level for Peary — and a quick glance at IMDb’s message boards and user reviews reveals that quite a few others feel the same way. In his first Cult Movies book, Peary relates an anecdote of going to see this film while on a road trip heading towards college for the first time, and how it “was a revelation to a college freshmen who hadn’t known there was life after high school”. In this essay, he offers an in-depth analysis of sections from Raphael’s script, arguing that “no contribution [to the film] is more significant than the screenplay”, and that it’s “a writer’s movie”. He points out how the script is rare in paying “as much attention… to gestures as… to dialogue”, and, given that it was written specifically for the screen, in specifying “every effect, movement and motivation” in cinematic terms. Indeed, reading Peary’s analysis provides me with better insight as to why it’s so critically lauded; yet while it may be true, as Peary writes, that “Joanna and Mark are emotional mosaics of the problems and roadblocks we each may bring to a relationship: the selfishness, the intolerance, the egotism, the misguided values, the impulsiveness, the thoughtlessness, the infidelity”, my inability to care about these particular characters makes it difficult for me to glean as much from the film as others apparently can. No, though it’s worth a one-time look, and may even become a personal favorite — it’s just not mine. Listed as one of the Best Films of the Year in Alternate Oscars. I had forgotten what a nothing movie this is. It’s so inconsequential that, halfway through, it simply implodes. It’s tiresome and filled with dull people who say and do nothing interesting. There’s no end to the couple’s yap-yap-yapping about a relationship that apparently was pretty much based on nothing in the first place. The characters played by Bron, Daniels and their daughter are just the nails in the coffin. Mancini’s theme song is initially lovely in the opening credits – and then it’s played to death in so many different variations that you’re almost sorry you heard the thing. Yes — I’m astonished how radically my opinion (and yours, apparently) differ on this one from Peary’s (and other diehard fans). It seems like one of those love-or-hate flicks.